CurrySimple provides the highest quality Thai food products in America. What began in the Thai food restaurant industry now transitions to your home kitchen. Michael Moran and his business partner, Nimitar Haremtepalhip, produce their line of red, green, yellow and massaman curry sauces, Pad Thai sauces, coconut soups and tea concentrates in Thailand using only the freshest authentic ingredients. 1. What is (was) your vision for your enterprise (your “history of the future,” that place in, say, 2018 where you would want it to be)? I see CurrySimple as a well established gourmet food brand that is widely popular in the US, UK and Australia. The brand will stay focused on only offering high-quality products! The foodservice side of the business will be huge! Restaurants around the world will be saving time in preparation and having a consistent meal to offer their guests by using CurrySimple. Big things will only happen if you think big! I would describe success on a few levels. The first, which I am currently on, is to reach the ultimate goal of truly being happy. This seems so simple but I meet people daily that would “seem” to be much more successful than I in business but you can tell are not happy. Is it worth it? I guess it would be up to you. You have two choices when you wake up every morning… To be happy or not to be happy… You decide daily. I choose to be happy and consider that successful. In the world of business… Just to stay in business is a huge success! If you can do this you are already on your way. To have the ability to walk away from your business and have it profitable and run without your intervention is a huge success! This means you have built a system that generates revenue and allows you to spend your time (time is the ultimate asset) doing what you please. Now, in just over two years later, I walk through my local Whole Foods and people come up to me and ask if I am the “Curry Guy”. To have brand recognition by others is a huge success! It is far from easy. CurrySimple has allowed me to travel to fun cities for food events and to the other side of the world (Bangkok) for product development. Can I retire right now? Not even close! Are people living their daily lives with as much excitement and adventures as I? Not many! Success if defined by how you feel at the end of each day and nobody can take that away from you. 3. Since you seem to be successful, how long did it take? I have reached multiple levels of success and it has taken my lifetime. CurrySimple took at least a year to start getting some serious notoriety. Although, being on the cover of the Washington Post’s Food Section after going live three months before was a huge help in the launch. Now after two years CurrySimple continues to be on a roll with no looking back. It cost me a lot less than you think in actual dollars because the way I had the business structured. I started CurrySimple while working two jobs (Loan Officer during the day & Bartending at night) and somehow found time to get the ball rolling with time in between. I had zero financial backing other than savings so I had to get really creative. The concept of the CurrySimple project was so exciting it kept me going in times where most may have quit. Then I go so deep into it there was no turning back. I designed my e-commerce website, product labels, did all the shipping and really everything else. Now I am slowly handing down the jobs to others so I can stay focused on larger projects. I am proof that you can start your company with very little money at the time of launch and get it off the ground. Do expect to work twice as hard and be three times as creative to do so! 5. 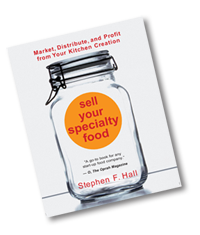 Can you offer any advice or counsel to the new-to- market specialty food firms? Have an informative website! This is the easiest way for people to get information about you and your business. You never know who might stumble upon it. Stay excited! If you are not excited about your product others will not be either. Stay excited! If you start to get run down take a few days off. You will come back much more productive and stronger. Be creative! Read as many books on creative marketing strategies. Keep the buzz around your product alive and get people excited. Word of mouth is the best form of marketing and it is free. This is huge when you are first getting started. More information about Curry Simple can be seen at: www.currysimple.com.